I've just finished two days in the archives at Stanford University. I came here for the David Starr Jordan (1851-1931) papers- a huge collection of material from one of the best known ichthyologists in the United States. Jordan is an interesting figure: a eugenicist, peace activist, university president (at Indiana University and the first president of Stanford), fisheries researcher, taxonomist and general leader of science in America at the turn of the 20th century. Most of the papers I looked at ended up covering territory other than his research on fishes. In fact, neither the archivist at the California Academy of Sciences (he was president for a while) nor the archivist at Stanford know where the majority of his fish papers reside- each suggests it resides with the other institution. I looked at about 60 moleskin notebooks in the collection- tiny books containing daily scribbles including shopping lists, general comments about the government, financial details, and a lot of unintelligible scrawl. What I had hoped to find, notes about his taxonomical work, and especially his use of photography, x-ray, and aquariums to render fishes more lifelike in illustrations, was mostly absent. My other interest, the founding of the Hopkins Marine Station in 1892, was also lightly represented in his notebooks and letters. But, what I did find was something that brought my research at Berkeley and Stanford a bit closer together and has forced me to think differently about marine laboratories founded on the West Coast. In both William Emerson Ritter's and David Starr Jordan's papers, I found extensive correspondence between these ichthyologists and the United States Fish Commission (renamed the U.S. Bureau of Fish and Fisheries in 1903 and Fish and Wildlife in 1940- it's now split between Fish and Wildlife and NOAA). Both Ritter and Jordan helped establish marine laboratories, and both hooked those laboratories into the extensive network of the USFC for funding, tools, and even staff support. 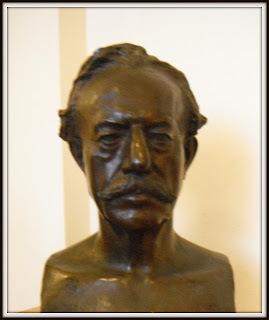 David Starr Jordan had a somewhat longer history with the USFC- he worked as an investigator for the USFC during his summers in Indiana, and traveled West to examine salmon and trout populations throughout Colorado and Utah in the 1880s. He maintained his connection to the Fish Commission after his move to California, eventually heading the Pribilof Seal Commission and eventually helping Japan, Russia, America and Canada ratify a seal treaty that would bring the seal colonies on these islands back from the brink of extinction (although extinction continues to threaten the seals). Jordan linked the Hopkins Marine Station with the USFC by attracting one of the leading members of the Commission to California. During his work in Indiana, Jordan worked closely with Barton Warren Evermann. Evermann was wooed to California by Jordan in 1893, to work at Hopkins during the summer and to research for the USFC during the winter months. He would return often to California and the Hopkins Station, even after becoming the head of The Division of Scientific Inquiry at the USBF in 1903. With Evermann and Jordan leading the Hopkins Station, the earliest problems tackled at the laboratory were fisheries based. W.E. Ritter felt that the Pacific Ocean held a great capacity for feeding the rapidly expanding population of Southern California. His problem: no one really even knows what's in that water! (scary, I know) In 1902, he contacted the USFC with a proposition: the Marine Biological Association of San Diego and the USFC could band together to figure out what is in the Pacific, what is rapidly disappearing, and what we can do about it. Of course, the USFC said something along the lines of "hell, yeah!" and a strong relationship between the Scripps Institution and the USFC was born. Scripps sent an enormous amount of information on fish hauls and new specimens to the USFC in Washington, and worked with the government to realize the natural resources of Pacific environment in Southern California. These links have sent me back to my work. Were West Coast laboratories more connected to government fisheries than East Coast? If so, why? Both Ritter and Jordan courted a link between their marine laboratories and the USBF; tracing these links and what it meant for these laboratories is my next step.